It has been a while since I last had a Boots Meal Deal for my lunch, and as I work so close to a branch I thought I would investigate what’s new. There is a new healthier range called Nutritious which isn’t just lower fat it is more balanced and provides a better intake of nutrients like fibre and help towards your five a day. 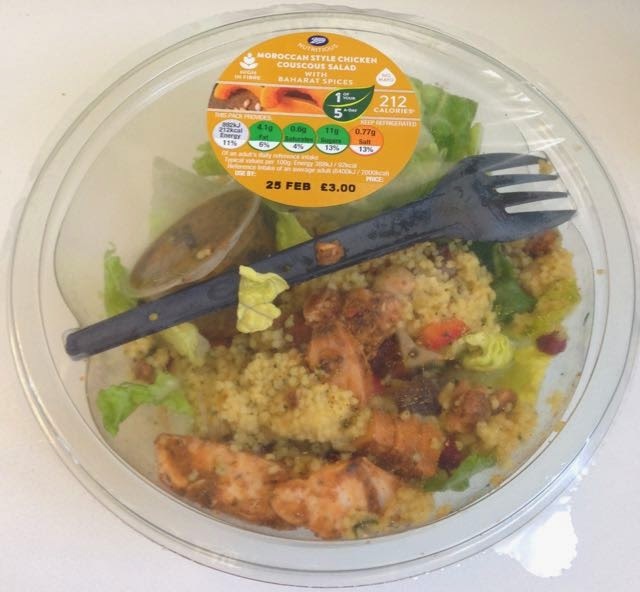 I liked the look of the Moroccan Style Chicken Couscous Salad so picked that, and an interesting looking veggie and fruit mix drink. For my snack all I could see were grapes in that range. I do put this down to me being a little late for lunch and the shelves had been picked over, so I went with some shapers crisps instead. I had already snacked on some grapes in the morning so wanted something different. The good things about the Boots Meal Deal is you can mix and match a bit. The salad had a nice mix of ingredients, from salad to couscous, peppers, currants and even pomegranate which added a nice sweetness. The chicken was moist and nicely spiced. It wasn’t too hot, but the mix of spices added a nice interesting tang to the salad. The dressing it came with was quite sharp and vinegary and I didn’t pour it out I just used it as a bit of a dip with the lettuce which worked out rather well. 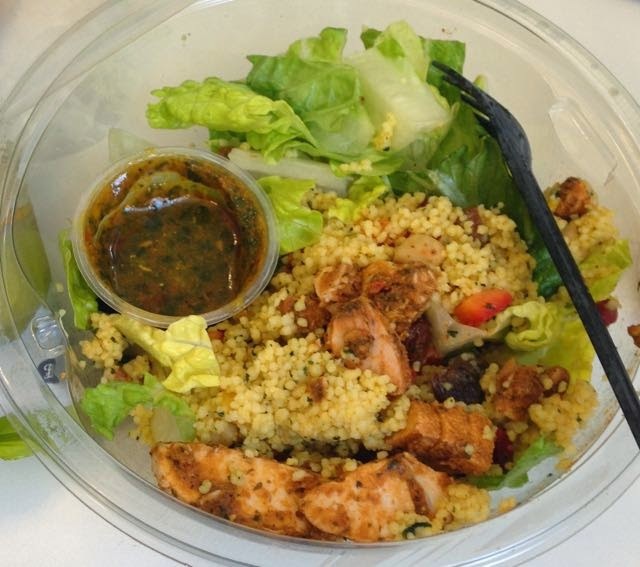 I was impressed by just how filling and tasty the salad was, it left me feeling quite satisfied. I think the couscous helps in filling you up. This tub of salad only seemed to have one of your five a day which is a bit of shame, and quite hard to believe with all that goodness in it. I would have thought that a range designed to provide nutrition might have more in its main item. It has to be said I did throughly enjoy the salad and it is something I’d have again. Lucky for me the drink I selected also provided one of my five a day. It was a mix of carrot, parsnip and mango juice. The flavour wasn’t too strong and did still taste sweet despite the emphasis on the veggies. I picked up on mainly carrot and mango with a hint of parsnip in the background. It was a pleasant drink, but you could tell it was from a healthy range. The flavour wasn’t too strong and it wasn’t as fruity as I’d have liked. I’m guessing at this point if I’d chosen those grapes my lunch would have been three of my five a day all in one, making it easier to get to the full five. As it happened I had munch on the sour cream and chive disc crisps I’d selected later on in the afternoon, which still made for a tasty snack.